I just had to share this great idea I saw about how to teach your children the Word of God. It comes from Mindy at Child Training Bible. She and her husband are a homeschooling family and have come up with this fun and creative way to use God's Word in teaching their children. Not only did they come up with the idea, but they will show you how to make one for yourself. 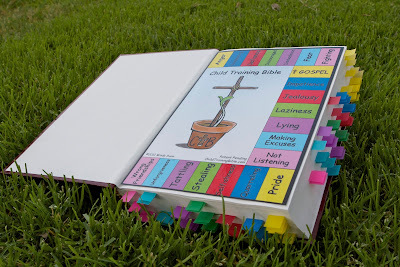 You can order the Child Training Bible Key and the Scripture Tabbing Charts directly from their website and they also provide links to additional products you will need. AND... they even have a how-to video! If you like this idea... please visit their site by clicking on the button below. They have a wonderful idea and I appreciate their willingness to share it. Give them your support and pass it along.